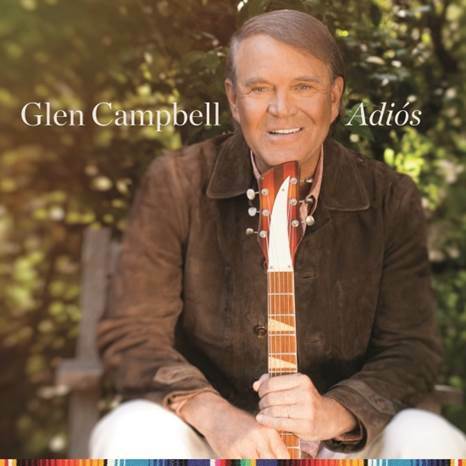 Glen Campbell‘s heart-wrenching battle with Alzheimer’s disease has touched fans across the globe, and Campbell is saying goodbye to the career and life he knew as an entertainer in a poignant way with a final studio album, aptly titled, Adiós. The album, which caps off a career that has spanned more than five decades and 50 million albums sold, will be released June 9 on UMe on CD, vinyl and digitally, and is available for pre-order beginning today here. Recorded at Station West in Nashville following his “Goodbye Tour” which was launched after Campbell revealed he was diagnosed with the disease, the album was produced by Glen’s longtime banjo player and family friend Carl Jackson. Jackson has been with Campbell since the ’70s when he first joined the band as an 18-year-old, and laid down some basic tracks and vocals for Campbell to study and practice in recording this final collection. In her liner notes, Kim Campbell, Glen’s wife of 34 years, explains the genesis of the album, details the recording process and explains why Adiós is finally being released.